After a few weeks with the Google Home (the voice-activated speaker powered by the Google Assistant) I’m a fan because it’s so convenient for playing music and radio. I’m finding myself listening to both more (and consequently watching less TV!) since it’s just so easy to walk into my apartment and say “Hey Google, play 90.9FM” or “Hey Google, play Allman Brothers.” For me, that alone makes it worth the price*, even though the rest of the features are pretty ho-hum. You may be rolling your eyes right now and thinking “Christ, how lazy are you? !” or “Why not just use Bluetooth like the rest us? 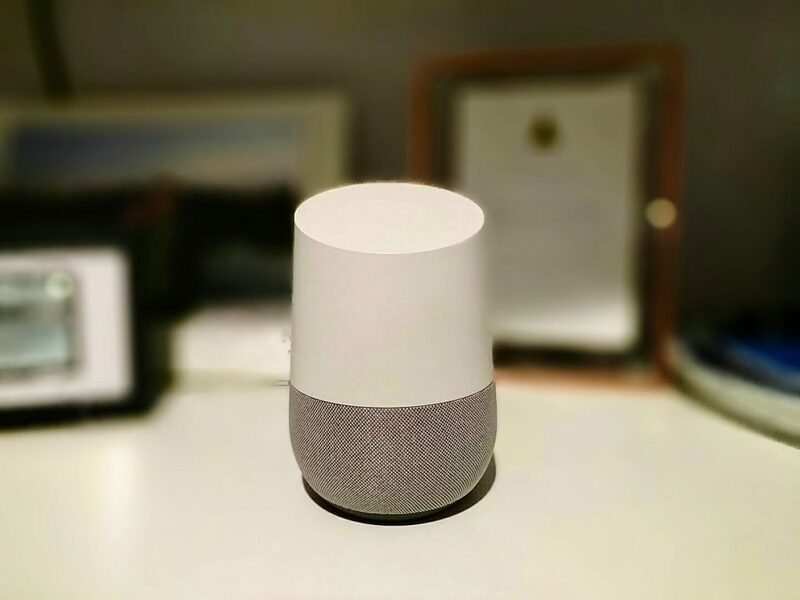 !” I admit, I was skeptic at first too, but we speak to our Google Home 10-20 times most days at this point. When I first took it out of the box, I was worried it wouldn’t be loud enough. But for our home’s size (738sqft) the Home produces room filling, deep sound. “Hey Google, set the volume to 30%” is about right for when we just want something in the background, but might want to talk too; 50% feels pretty loud, and 100% is louder than we could possibly yell over. Our home’s size also allows the microphone to hear us basically all the time, even around corners or through open doors. So it passed my “speaker test” which brought on my two part “utility test.” When I walk in my front door, my dog greets me and demands a couple minutes of petting so she can be sure I still love her. Then I usually unload my pockets, and move on to starting some meal prep, so minor tidying, tending to my rabbits or something else — all of which seem to occupy my hands and all of which used to stop me putting on music or radio via Bluetooth. The fact that it required my hands to 1) turn on Bluetooth 2) pick something and 3) get it connected to the speaker was just enough of an impediment that I rarely did it. Now I just say “Hey Google, play _____” and so it passes my “utility test – part I” as well. Utility: Part II is all about voice recognition, which the Home excels at. There’s only been a handful of times that we’ve had to repeat ourselves, though you do have to learn a few phrases. First you have to train yourself to start by saying “Hey Google” (or “Ok Google”) then you have to remember things like: just to play a song, you have to specify the artist (“Hey Google, play Blinded By The Light by Manfredd Mann’s Earth Band.”) Once you say “Hey Google” the volume is automatically reduced and after you spear, it will say what its going to do in response (“Ok, playing Blinded By The Light by Manfredd Mann’s Earth Band on Spotify”) or say “I didn’t understand.” This all feels reasonably natural and we learned quickly. We haven’t grown fond any of Google Home’s other features we’ve tried, like “Ask Google” or “Ok Google, what’s the weather.” For that, we still seem to just whip out a phone. And without any other smart devices or other Homes, we haven’t gotten to try the multi-room or home automation capabilities. We also haven’t really used the shopping list or the new Buy Via Google Express features, nor tried to use it in conjunction with a Chromecast to control our TV. Lastly, we haven’t considered the privacy implications. The Google Home is always listening for “Ok Google” and it stores everything you say it to on Google servers. Personally, I already trust Google to manage my phone, my email, my photos, my searches, my files and my location, so… meh. So, would I recommend it? Yes, assuming your situation is anything like mine in terms of home life and home size.